Guinea Pigs are a great first pet to own, not only are they easy to care for and low maintenance they are extremely affectionate and social for their small size! Owning a pet is a big decision and part of having a pet is making sure they have a great home to live in. It all starts with a Hutch – Guinea Pigs should be housed in a hutch with a min size of 60cm x 30cm x 30cm (this is for one Guinea Pig) its best to provide them with the largest shelter that you can. Hutches need to have adequate room for them to move about as they enjoy running and playing. Provide a few places where they can hide- a cardboard box or plastic igloo (Pigloo). Ensure the hutch is not in direct sunlight as Guinea Pigs don’t cope well in high heat; make sure the hutch is well protected from wind and rain. The Somerzby range has a great set of features that are sure to keep Guinea Pigs happy and healthy. a hutch and run package. It’s important that Guinea Pigs get exercise and an outdoor Guinea Pig run will provide them with fresh air and room to move and run around in. Ensure that the run is in a safe and shaded area with plenty of grass for them to eat and run around on – don’t forget to add something they can hide in. 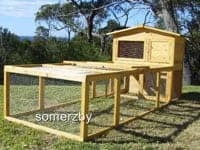 The Somerzby range of Guinea Pig runs can be used as a standalone run or can be attached to the Somerzby hutches. Hay, hay and more hay! Guinea Pigs love hay, they will not only sleep in hay but they will also eat it. Make sure your Guinea Pig has lots of this stuff in their hutch as they love to burrow and make a nest within. A great hay to use is Timothy Hay as this also has a higher nutritional value and is safer for Guinea Pigs. A layer of wood pulp under the hay will also ensure your Guinea Pig is comfortable, make sure it’s not cedar or pine as these wood type can be toxic to Guinea Pigs. A small soft pet bed designed for Guinea Pigs can be purchased at selected pet shops- they should have a fleece lining so they will stay comfortable and warm. Otherwise a thick piece of fleece will also keep them cosy and warm. Place your guinea pig feed in a heavy based bowl, this will prevent your Guinea Pigs knocking over the bowl and food. 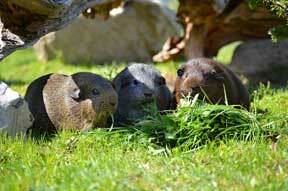 Guinea Pigs are herbivorous, it’s important that they are provided a constant source of grass or grass hay. Offer them a variety of food types and plenty of fresh leafy green vegetables, be careful however to not feed them iceberg lettuce, leeks, onions, potatoes, rhubarb and the leaves, spring onions, tomato leaves or mouldy fruit and vegetables as these can be highly toxic to them. Dried food can also be given to Guinea Pigs, ensure that it states Guinea Pig food on the packet and not Rabbit food as Guinea Pig food has vitamin C added. Guinea Pigs love to chew things! They also love things they can sit in such as tunnels, paper bags or cardboard boxes. Having these items in their hutch will also provide places they can play and hide in as well as chew on. It’s also a good idea to provide them with a chew block made from un-dyed wood. Chew blocks help them grind down their teeth – helping them avoid any dental issues. It’s important to keep a clean environment for your Guinea Pigs. Make sure and uneaten fruit or vegetables are cleaned out daily, remove any soiled hay and replace with fresh hay. The hutch should be cleaned out once a week. Make sure you place your Guinea Pigs somewhere safe when you clean the hutch out. Do not use household cleaner in or on the hutch. At Somerzby we have designed and developed a great range of Guinea Pig Hutch/Enclosures, Breeding Banks and Runs that will keep your pets safe and healthy. Please click here for more information about our great Guinea Pig home/hutch and Guinea Pig Run packages. This entry was posted in Guinea Pigs and tagged care, cavie, guinea pig, health, home, homing, hutch, run.